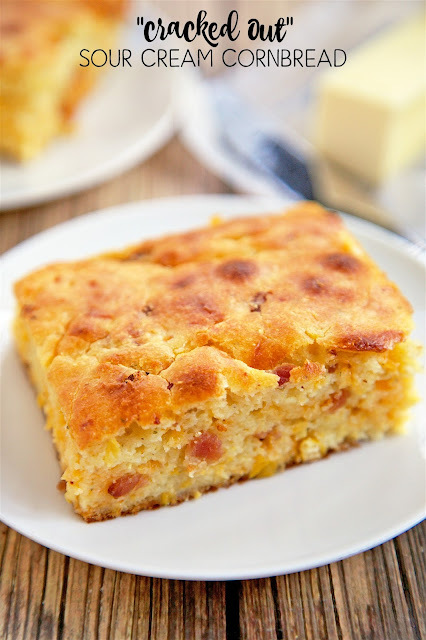 Cracked Out Sour Cream Cornbread - quick cornbread recipe kicked up with cheddar, bacon and Ranch. Cornmeal, sour cream, creamed corn, cheddar, bacon and Ranch. 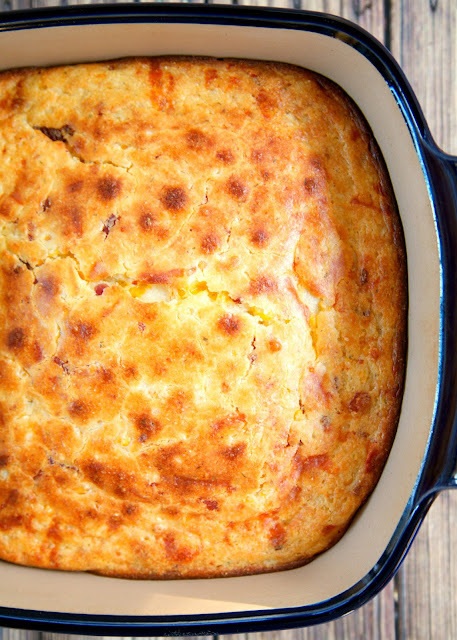 This is the most requested cornbread recipe in our house. Everyone loves it! It is super easy to make and tastes amazing! A few months ago, I made a batch of Sour Cream Cornbread. My Mom sent me the recipe and it is Chicken Legs' favorite cornbread recipe. He asks for it all the time. It is really good. I thought if it was good regular, I bet it would be AMAZING "cracked out" with cheddar, bacon and Ranch added. Well, I was right. This was sooooo good! I could have made a meal out of it! 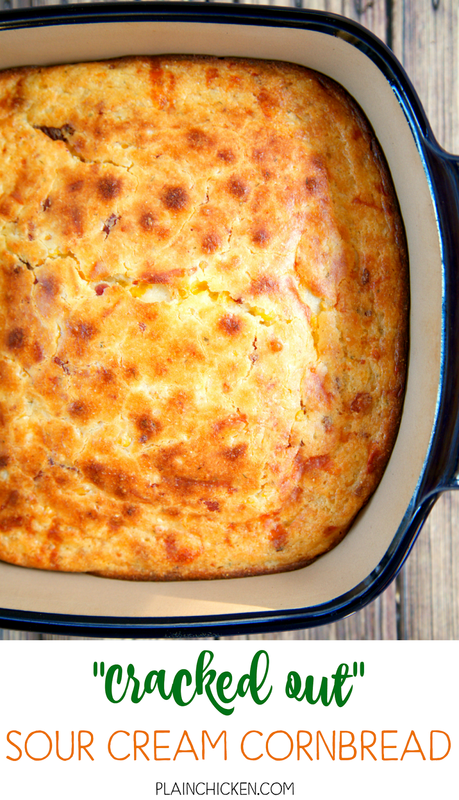 This "Cracked Out" Sour Cream Cornbread is great with soup, chili, beef stew, baked chicken or any grilled meat. Really, it is good with anything! We make this all the time. Give it a try at your next meal!! I promise it will be a hit! Preheat oven to 450 degrees. Lightly spray an 8x8-inch pan with cooking spray. Mix together all ingredients. Pour into prepared pan. Bake for 30 to 35 minutes, until golden brown. Looks and sounds great. Thanks for this and all your great recipes. God bless you and yours, kitties too. In Christ, Allen. 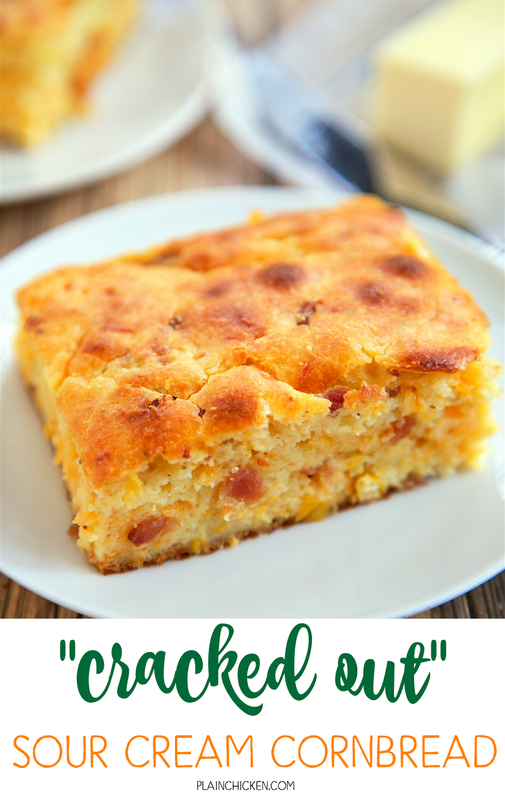 Looks like a very interesting take on cornbread - I like everything in it. What could I add to corn meal if I don't have self rising corn meal? I made this few weeks ago... everybody loved it. Somehow I forgot about this but hubby made sure to remind me! LoL! Guess what we are having tonight? !